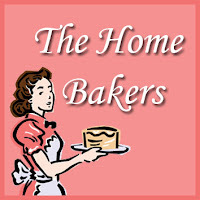 It’s time for The Home Bakers again! This time the cake was chosen by Grace from Life Can Be Simple. The cake is mixed together without the use of a mixer (hooray!) and without the use of butter (oil is the fat here). Oil-based cakes are moist and tender, and this cake is no exception! I scaled down the recipe by 1/3 and made a few substitutions here and there (see end of the post for the substitution notes. I also made candied lemon slices to decorate the cake. On the first day, when I tasted the cake, despite the cake being moist and tender, the lemon taste wasn’t strong at all (even though I did not omit the lemon glaze). I was a little disappointed and wondered whether I should bake again and increase the amount of lemon used. On the second day, when I tasted the cake, I was surprised – after a night of resting, the lemon taste became more intense! So do try to make the cake a day ahead so that it had time for the flavours to develop! 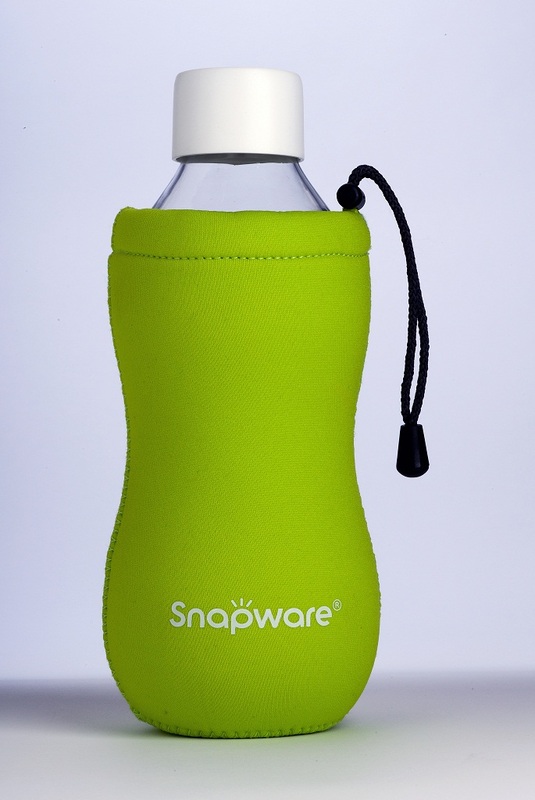 SNAPWARE® Eco Flip and SNAPWARE® Eco Grip are two new products released by World Kitchn. What’s special about these tumblers is that they are not made of plastic, but glass! And not just any type of glass, but borosilicate glass – a non-porous and non-toxic material which is very resistant to thermal shock as compared to other common glass. It is the type of glass used to make Pyrex kitchenware! In Singapore, many of us carry water tumblers to school, to work and even to the gym, and you may have experienced that when you use plastic or metal tumblers, the liquid will sometimes have a plastic / metallic taste. This will not happen if you are using a glass bottle. Besides, glassware are 100% recyclable, more environmentally friendly and have a longer lifespan than plastic bottles! Undoubtedly it will be a little heavier than normal plastic bottles, but hey, the pros certainly outweigh the cons don’t you think? 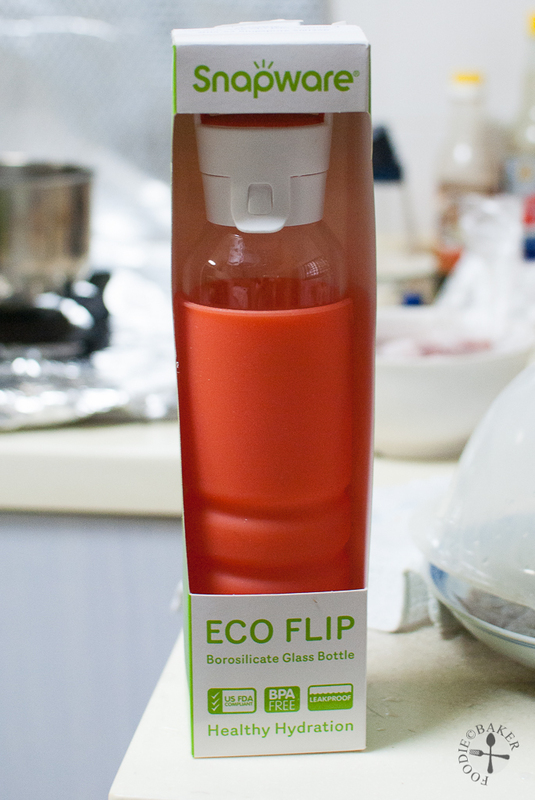 Featuring a patented 2-part leak-proof cap system, the Eco Flip is slim yet capable of holding up to 500 ml of liquid. It will fit snugly in bags and car beverage holders. The special non-slip jacket provides added protection against warm beverages and easy grip. The Eco Grip features a neoprene sleeve allowing for a comfortable and easy grip. Capable of holding up to 600 ml of liquid, the included nylon strap enhances portability and access on-the-go. 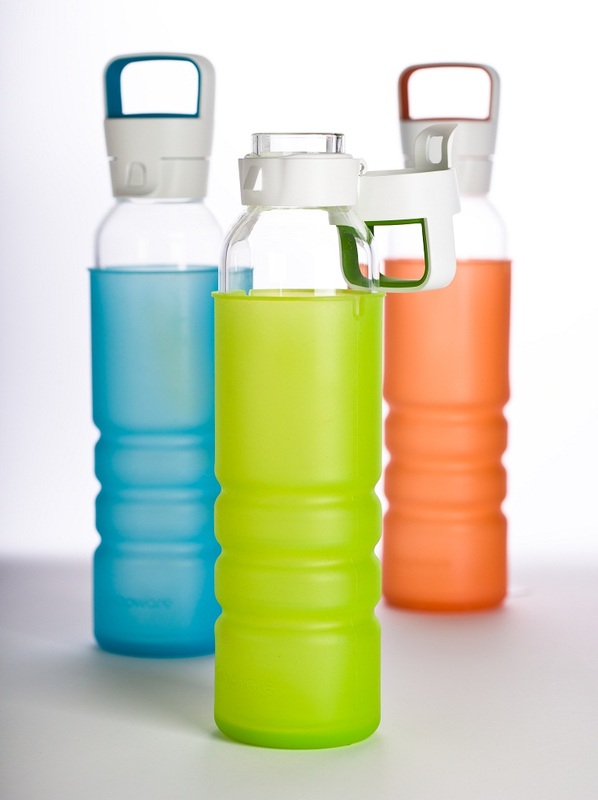 Both the Eco Flip and the Eco Grip are US FDA compliant, dishwasher safe and are completely free of Bisphenol-A (BPA). For Singapore readers: available in 3 vibrant colours of green, cyan and tangerine, Eco Flip will retail for just $19.90 (U.P $29.90) while Eco Grip will retail for just $14.90 (U.P. $23.90). Promotion will last from 6 Jun – 30 Jun 2013 and they can be found in major departmental stores – Robinsons, Metro, Tangs etc. For more information, please refer to the World Kitchen website. Here’s how to make the cake! 1) Slice a large lemon as thickly as possible. 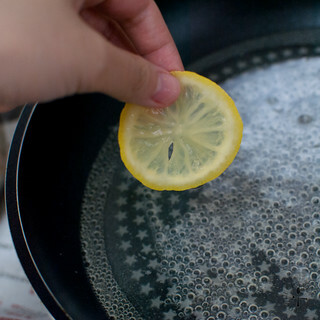 2) Boil the lemon slices until softened. Reserve 1 cup of the hot lemon water. 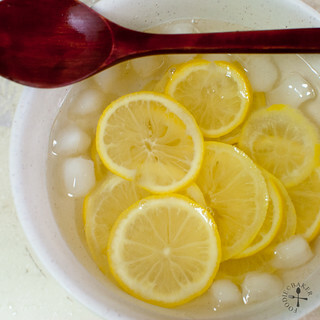 3) Plunge the softened lemon slices into ice water. 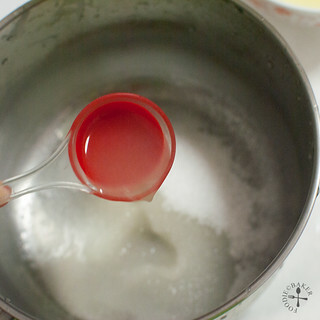 4) Combine sugar and reserved lemon water and bring to a simmer. 5) Simmer the lemon slices for 1 hour. 6) Let candied lemon slices cool completely on a lined baking tray before using. 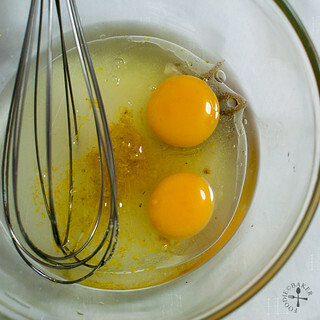 7) For the cake, combine eggs, sugar, olive oil, lemon zest and a little vanilla in a large mixing bowl. 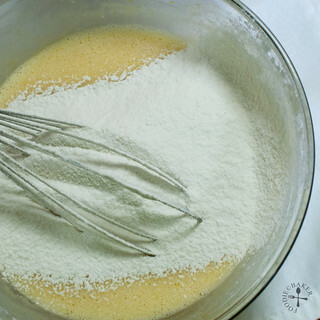 8) Whisk the mixture together for about 2 minutes. 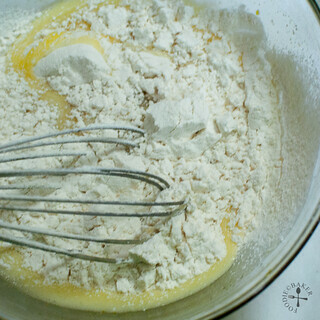 9) Sift and stir in 1/3 of the flour mixture (flour, baking powder, baking soda and salt). 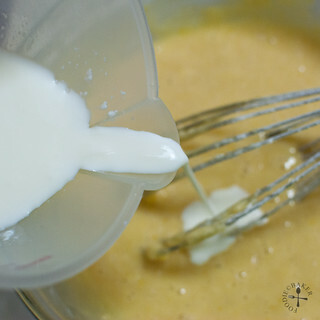 10) Gently whisk in 1/2 of the buttermilk. 11) Sift and stir in 1/2 of the remaining flour mixture. 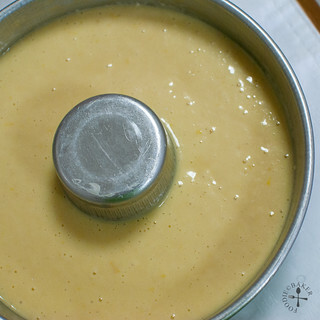 12) Stir in the remaining buttermilk. 13) Sift and stir in remaining flour mixture. 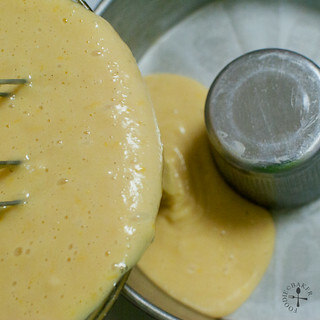 14) Transfer the batter to a greased and bottom-lined cake tin. 15) Bang the cake tin twice on the table counter to release excess air bubbles and bake the cake! 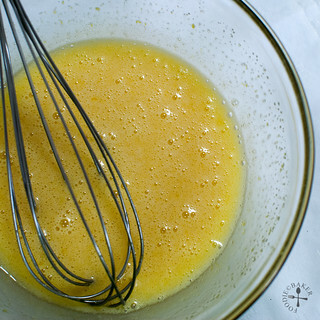 16) While cake is baking, combine lemon juice and sugar together in a pot and bring to a boil. Boil for 1 minute and remove from heat. 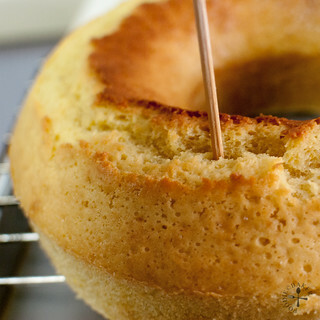 17) When a skewer inserted into the cake comes out clean, remove cake from oven and set on a wire rack for 10 minutes. 18) Run a knife along the edges of the cake and invert the cake out onto a wire rack. Poke holes all over the cake to absorb maximum syrup. 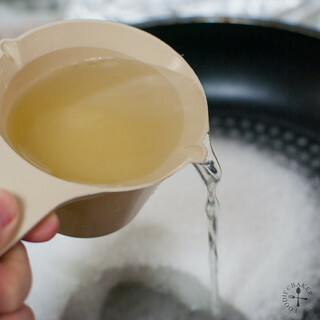 19) Set the wire rack over a baking sheet to catch excess syrup drippings. Pour syrup all over the warm cake. Let cake cool completely on a wire rack. 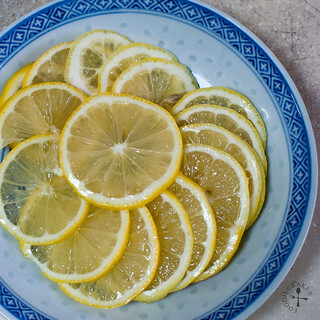 20) Decorate with candied lemon slices. The cake actually tastes better on the second day! Do check out other fellow Home Bakers’ take on this cake here! Note: I scaled the recipe down from 3 eggs to 2 eggs, substituted olive oil for canola oil, and omitted the nutmeg (none on hand) and the nuts (I was lazy). I also made my own buttermilk by combining 2/3 tablespoon lemon juice with 2/3 cup milk. My cake was baked at 175 degrees Celsius for 35 minutes. 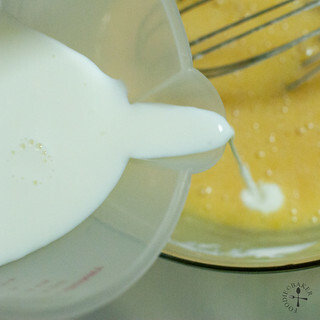 After drizzling the syrup over the cake, store the cake in a container and let rest overnight before serving. The flavours will be more intense, i.e, more lemony! For the full instructions, please refer to Grace’s blog (Life Can Be Simple)! Wash and scrub the lemon. Slice the lemon as thinly as possible - either using a sharp knife or a mandolin. Dig out and discard the seeds. Discard both ends of the lemon. Prepare an ice water bath and set aside. Bring a pot of water to rolling boil. Add in the lemon slices and cook for about 1 to 3 minutes, until the lemon slices have softened. 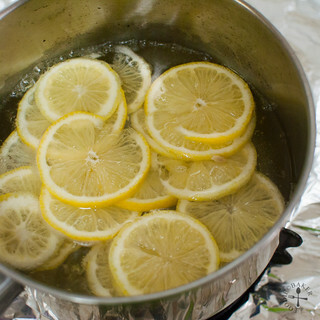 Remove the lemon slices and immediately transfer them into the ice water bath. Once the lemon slices have cooled completely, drain. Reserve 1 cup of the hot lemon water. In a large shallow pan (large enough to hold the lemon slices in 1 layer), combine the cup of sugar and the reserved hot lemon water. Bring the syrup to a simmer and add in the drained lemon slices. Simmer the lemon slices for 1 hour. 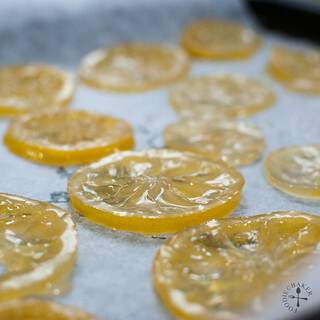 Transfer the candied lemon slices to a lined baking sheet. Let stand until ready to serve. 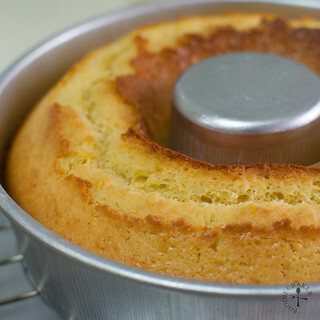 Hi Jaslin, im interested in baking this buttermilk cake but do not hv a bundt pan, was wondering if i can bake it in a chiffon pan? Is the batter runny? Thank you. Hi Zoe, I suggest filling the 6-inch round until 2/3 full. If you have leftover batter, bake them in muffin tins or ramekins. You are welcome, good luck! Hope you will like the cake as much as I did! Oh dear Jaslin, i dun hv a 6″ – its a 7″ round. Guess i hv to use my 8.5″ x 4.5″x 2″ loaf pan. Lovely results you got there! and thanks for the tutorial for the candy lemon garnish! This looks interesting esp. the candied lemon slices. 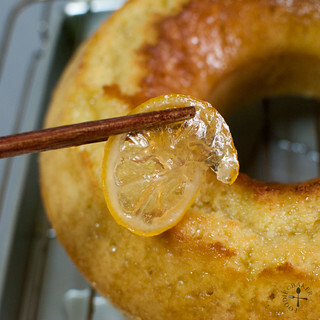 I can imagine that the cake is yummy with the added lemony syrup…..looks good! Love the glazed lemon on the cake, Jasline! I love a good citrus cake any day! love how you decorated the cake with candied lemon slices. Would be a good cake to have for breakfast since it’s not that sweet! Jasline, I love your idea of combining candied lemon slices with this cake. It is absolutely delightful! I will try out your recipe for candied lemon slices. I love your cake, it’s so pretty. This cake looks so very good, Jasline, and the candied lemon slices are a great finishing touch. 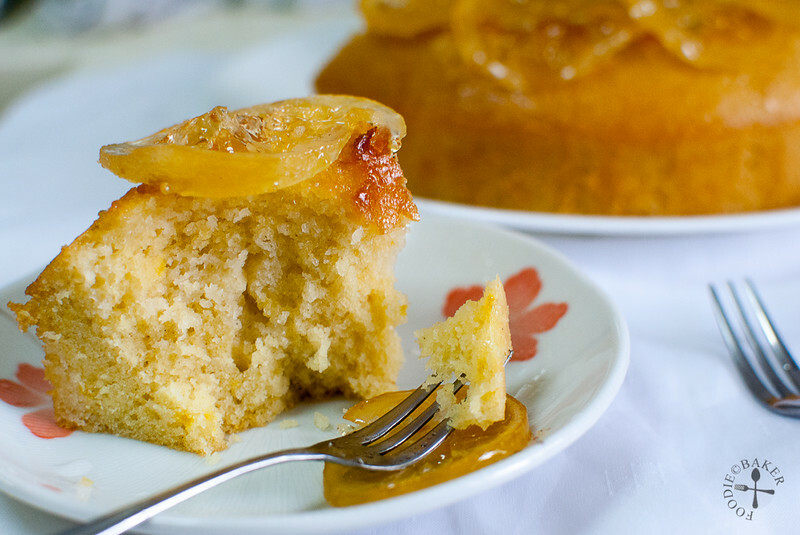 I’ve said before I love a citrus glaze and the lemon slices take this cake over the top. Thanks for sharing. 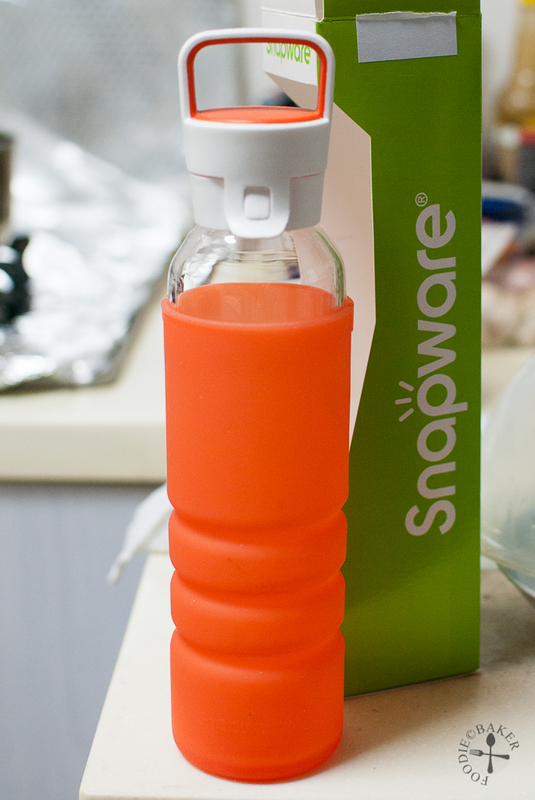 I’m very familiar with the Snapware brand, using their containers to store items in the freezer and pantry. I’ll certainly check out these bottles. Hi Suzanne, oil based cake is a nrw found love for me 🙂 can’t wait to try more recipes! Aww that’s so sweet! I love how the candied lemon is tart and sweet at the same time as well! 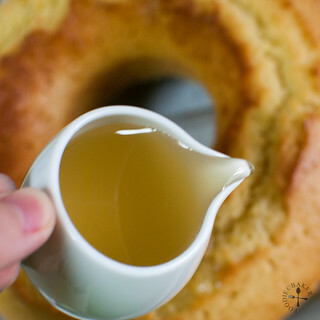 I love oil based cakes – they’re so quick to put together and always amazingly moist. 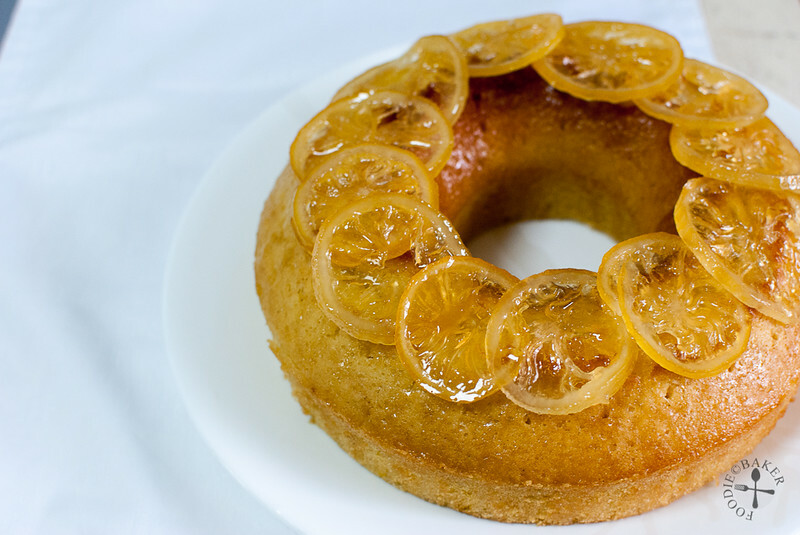 The candied lemons are gorgeous – they totally elevate this humble cake into something special! 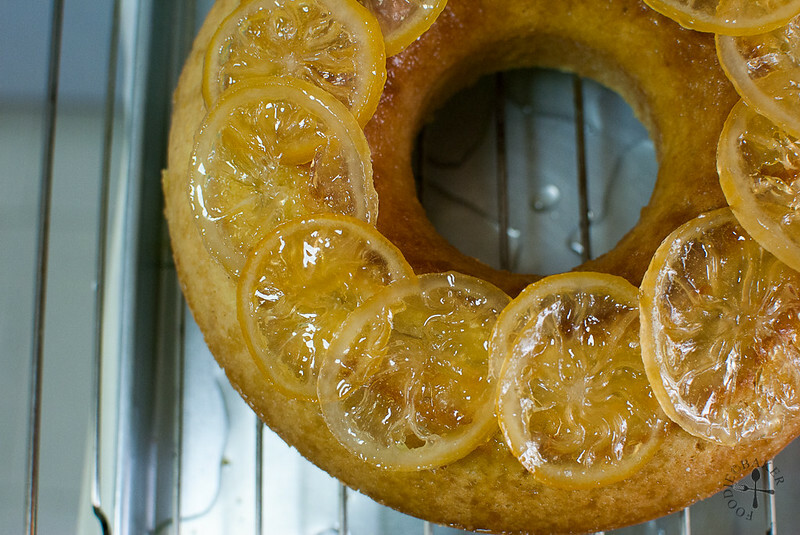 Your candied lemons look fantastic on the cake! The candied lemon slices looks good with the cake! A great idea! This cake is very tender, light and moist. I really love the lemony flavour. What a cool gift! The water tumbler looks very nice with very pretty colours! I’m loving using buttermilk in baking, for the first time. So this has to be a winner, especially with the olive oil. 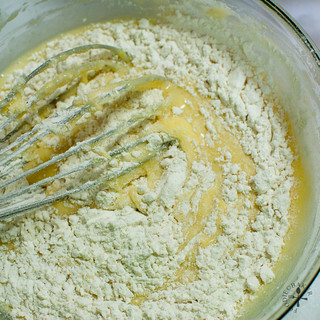 Okay, and maybe the fact it’s easy to whisk! I love lemon and oil based cakes. It looks delicious and good to know that the lemon flavor intensifies over time, The snapware is so cute, really functional and very chic, Love it!